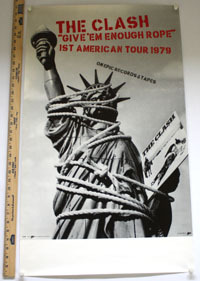 Original 1977 tour poster in support of their all-time classic debut LP! Measures 23" x 33½". Minor wear to edges but overall in excellent condition. The best poster to come jumpin' out of the Rodeo chute in quite some time! 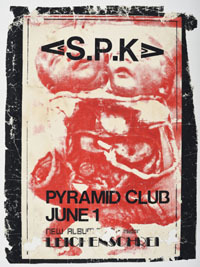 Scarce silkscreened original 14" x 18" poster for an early Seattle show in June 1978. Some toning and old tape residue on back. 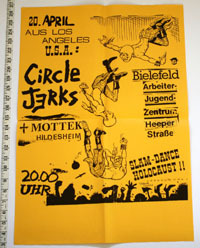 German tour poster from April 1985 (I'm pretty sure). Features Shawn Kerri artwork. Folded twice. Measures 17" x 24". 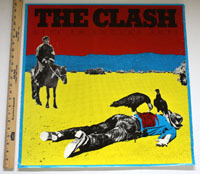 An absolute eye-popper for the Clash's first US tour! Guaranteed original 1979 CBS/Epic-issued poster with unprinted snipe area at bottom. Measures approximately 20" x 34". Note: there are plenty of UK repros of this poster (sans Epic logo) floating around. This one is identical to the original that Bonham's sold for over $1300! Excellent condition. Original 23" x 23" promo poster issued by CBS in 1985. Some rumpling and a little wear-n-tear along edges. 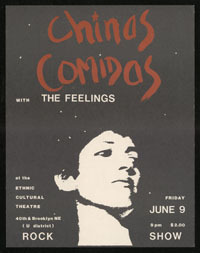 Original 1978 US promo poster. Design by Hugh Brown. Some wear-n-tear along right and left edges. Measures approximately 23" x 23". 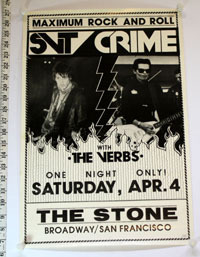 Original April 1981 poster for this SF gig. Measures 14" x 21". Small tear on left edge and some old glue on backside. Stored rolled. 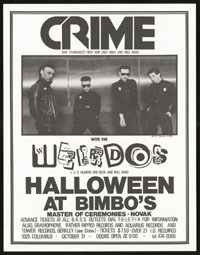 Halloween 1977 poster on thin stock for what turned out to be a total flop of a gig despite heavy promotion. Measures 18" x 23". Minty condition! 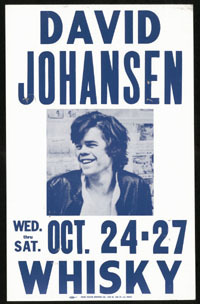 14" x 22" heavy chipboard boxing style poster manufactured by Colby Poster Printing Company for an October 1979 gig in LA. Several closed staple tears from being removed from a telephone pole. Original 1981 poster for the original release of this Penelope Spheeris classic. Fold lines, some generalized wear including an edge tear at bottom which has been stabilized with archival tape. Overall in very good condition. Measures 27" x 40"
Note: lately, an eBay jacktard called "refrigeratornoise" has been selling lousy digital repros as originals. Caveat emptor! This one here is a genuine, from-the-time original. 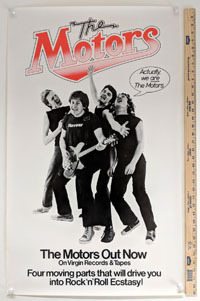 Original 1981 US promo poster for New Traditionalists Measures 21½" x 35". Stored rolled and in excellent condition. 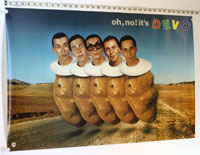 Original 1982 US promo poster for Oh No! 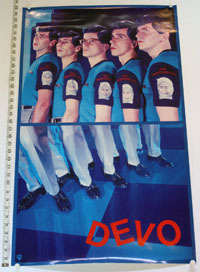 It's Devo Measures 35" x 23". Stored rolled and in excellent condition. August 1978 boxing style poster printed by Colby. 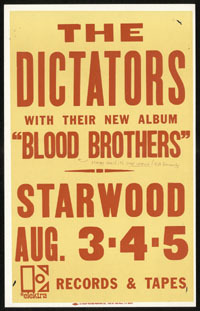 Includes a handwritten, straight-from-the-producer gripe/correction about Bloodbrothers being one way. Staple tears from being removed from a telephone pole, but overall in nice shape! Crudely silkscreened 12" x 18" poster on thin stock for this Osh Kosh, Wisconsin show in August 1984. Somewhat miraculous this delicate creature survived. Super sick! 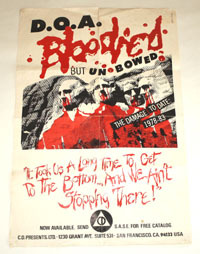 Original 1983 CD Present promo poster for the Bloodied But Unbowed compilation. Folded three times with general wear and light staining. 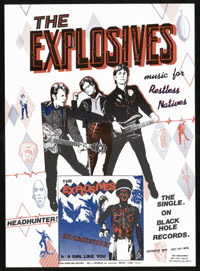 1982 promo poster for the third Explosives 7in. Measures 16" x 22". Minty condition! It seemed like a good idea in at the time: get a bunch of Texas punk bands to recreate Altamont in October 1979. 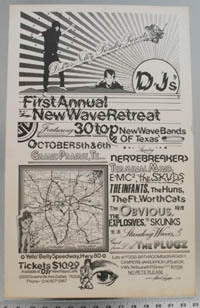 Sponsored by the legendary DJ's (a pioneering punk venue in Dallas) proprietor and apparently a flop despite the line-up. 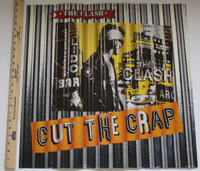 Cool poster design by Frank Campagna. Some toning to edges but overall in great shape. 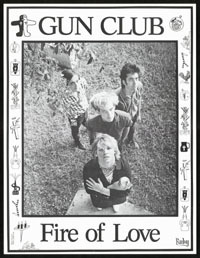 Beyond great original 1981 Ruby label promo poster for the Fire of Love LP. Features a Chris D. photo paired with Judith Bell illustrations. Offset print on semi-gloss stock. Measures 17" x 23". 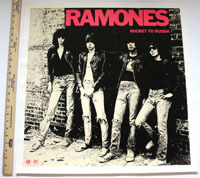 What looks to be an unconstructed LP cover (the part that gets pasted to boards to make a tip-on jacket) seems to be have been issued as a promo poster by Factory (US) in 1981. Textured stock has tackholes are top corners and minor wear. Overall in very good condition. Measures 28" x 14". A rare one! 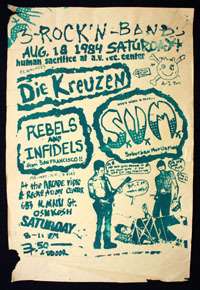 Original 1981 promo poster issued by Wasted Talent. Measures 23" x 26". Stored rolled and in excellent condition. 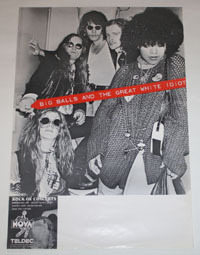 Original 1977 promo poster issued by Virgin Records. Measures 22" x 36½". Light edge wear but overall excellent condition. Amazing GISM-esque, anti-Vietnam War poster by Weege from 1967. So punk I just had to list it! Measures 19" x 25". Impossibly rare withdrawn Ibanez promo poster issued in Japan in 1975, professionally linen-backed and ready to frame. This one just never seems to pop up. Poster has a couple small surface tear/paper loss near top right and lower right. Measures 20" x 28½". Syl and flyin' V's foreverrrr! 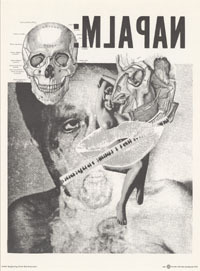 Original 1985 promo poster issued by Enigma. Poster measures 17" x 23". Folded twice. 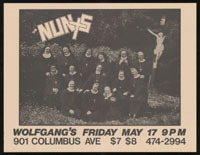 A later Nuns gig from May 1985 featuring a jolly gaggle of habits. Measures 22" x 17". Minty condition! 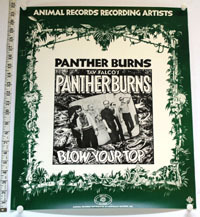 Original 1982 US promo poster for Blow Your Top Measures 18" x 21½". Stored rolled and in excellent condition. PVC Records promo poster issued in 1979 featuring 999, Eno, Simple Minds and Shoes. Measures 33½" x 22". Machine folded three times (as issued). 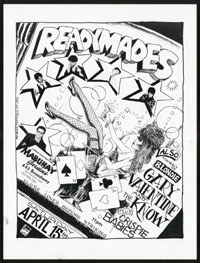 Original 1981 Ralph Records promo poster featuring artwork by Gary Panter! Tiny tear on top edge and folded twice (as issued). Measures 21½" x 28". 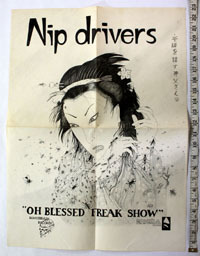 Original 1977 promo poster issued by Sire. Professionally linen-backed with no touch-up or restoration. Some wear to left edge but overall in very good condition. Measures approximately 23" x 23". Great hand-drawn design! Original April 1978 poster for this Fab Mab gig. Measures 17" x 23". Excellent condition! 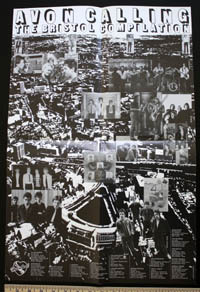 Circa 1979 poster with iconic Residents image. Folded three times with water staining and old tape on back. Price reduced based on lesser condition. Measures 28" x 22". Original 1977 US promo poster issued by Warner Brothers and designed by the great Ronn Spencer. Machine folded, as issued. Measures approximately 33" x 24". Significant corner and edge wear-n-tear. Priced reduced accordingly. 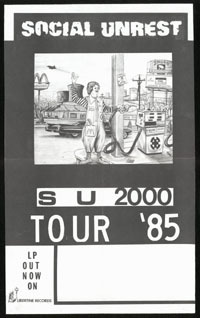 Original thin stock 1985 poster promoting the SU 2000 tour. 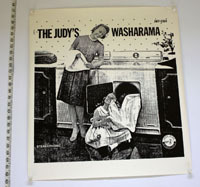 Poster measures 14½" x 22". Originally folded twice but stored flat. Impossibly rare (25 made according to one band member) silkscreened poster for SPK's stop in New York City in January 1982. As you can see, this one was literally peeled on a wall. I've had it professionally linen-backed but otherwise left it as-is. 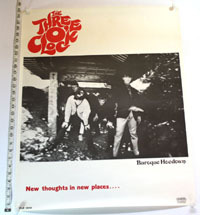 Original 1982 promo poster for this Frontier Records release. 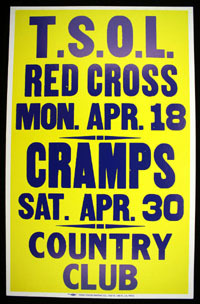 Paisley underground for your walls! Measures 23" x 29". Absolutely sublime 14" x 22" heavy chipboard boxing style poster manufactured by Colby Poster Printing Company for an April 1983 gig in LA. Never hung and in tip-top condition. 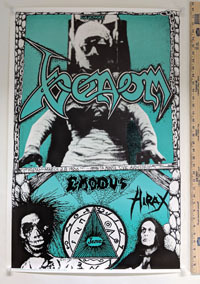 Original 1986 Otis & Biscuits poster for a dose of Venom/Exodus/Hirax metal mayhem in LA! Measures 23½" x 35". This is the rarer (presumed to be first) printing with teal ink and no logo in the ghoul's shoulder at lower right. 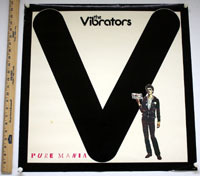 Original 1977 UK promo poster for a never-gets-old long player. Small stain in the white area to the left of the "V", some edge wear at upper left corner and old tape residue on back. Overall in very good condition. Measures approximately 23" x 23".